For other uses, see Timor (disambiguation). Timor is an island at the southern end of Maritime Southeast Asia, north of the Timor Sea. The island is divided between the sovereign states of East Timor on the eastern part and Indonesia on the western part. The Indonesian part, also known as West Timor, constitutes part of the province of East Nusa Tenggara. Within West Timor lies an exclave of East Timor called Oecusse District. 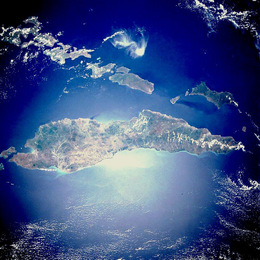 The island covers an area of 30,777 square kilometres (11,883 square miles). The name is a variant of timur, Malay for "east"; it is so called because it lies at the eastern end of the Lesser Sunda Islands. Mainland Australia is less than 500 km away, separated by the mentioned Timor Sea. Maritime Southeast Asia is the maritime region of Southeast Asia as opposed to mainland Southeast Asia and comprises what is now Malaysia, Brunei, the Philippines, Singapore, Indonesia, and Timor-Leste. The local Malayo-Polynesian name for the region is Nusantara. Maritime Southeast Asia is sometimes also referred to as "island Southeast Asia" or "insular Southeast Asia". The 16th-century term East Indies, and the later 19th-century term Malay Archipelago refers to a largely similar area. The Timor Sea is a relatively shallow sea bounded to the north by the island of Timor, to the east by the Arafura Sea, to the south by Australia. Anthropologists identify eleven distinct ethno-linguistic groups in Timor. The largest are the Atoni of western Timor, and the Tetum of central and eastern Timor. Most indigenous Timorese languages belong to the Timor–Babar branch of the Austronesian languages spoken throughout the Indonesian archipelago. Although lexical evidence is lacking,  the non-Austronesian languages of Timor are thought to be related to languages spoken on Halmahera and in Western New Guinea. Some are so mixed it is difficult to tell which family they descend from. An ethnolinguistic group is a group that is unified by both a common ethnicity and language. Most ethnic groups have their own language. Despite this, the term is often used to emphasise when language is a major basis for the ethnic group, especially with regards to its neighbours. The Atoni people are an ethnic group on Timor, in Indonesian West Timor and the East Timorese enclave of Oecussi-Ambeno. They number around 844,030. Their language is Uab Meto. The Austronesian languages are a language family that is widely dispersed throughout Maritime Southeast Asia, Madagascar and the islands of the Pacific Ocean, with a few members in continental Asia. Austronesian languages are spoken by about 386 million people (4.9%), making it the fifth-largest language family by number of speakers. Major Austronesian languages with the highest number of speakers are Malay, Javanese, and Filipino (Tagalog). The family contains 1,257 languages, which is the second most of any language family. The official languages of East Timor are Tetum and Portuguese, while in West Timor it is Indonesian. Indonesian is also widely spoken and understood in East Timor. Christianity is the dominant religion throughout the island of Timor, at about 90% of the population, but unequally distributed as West Timor is 58% Protestant and 37% Catholic, and East Timor is 98% Catholic and 1% Protestant. Islam and animism make up most of the remainder at about 5% each across the island. Islam is an Abrahamic monotheistic religion teaching that there is only one God, and that Muhammad is the messenger of God. It is the world's second-largest religion with over 1.8 billion followers or 24% of the world's population, most commonly known as Muslims. Muslims make up a majority of the population in 50 countries. Islam teaches that God is merciful, all-powerful, unique and has guided humankind through prophets, revealed scriptures and natural signs. The primary scriptures of Islam are the Quran, viewed by Muslims as the verbatim word of God, and the teachings and normative example of Muhammad. Animism is the religious belief that objects, places and creatures all possess a distinct spiritual essence. Potentially, animism perceives all things—animals, plants, rocks, rivers, weather systems, human handiwork and perhaps even words—as animated and alive. Animism is used in the anthropology of religion as a term for the belief system of many indigenous peoples, especially in contrast to the relatively more recent development of organised religions. Timor is located north of Australia, and is one of the easternmost Sunda Islands. Together with Sumba, Babar and associated smaller islands, Timor forms the southern outer archipelago of the Lesser Sunda Islands with the inner islands of Flores, Alor and Wetar to the north, and beyond them Sulawesi. The Sunda Islands are a group of islands in the Malay archipelago. Sumba is an island in eastern Indonesia. It is one of the Lesser Sunda Islands and is in the province of East Nusa Tenggara. Sumba has an area of 11,059.6 square kilometres, and the population was estimated to be 755,849 in 2015. To the northwest of Sumba is Sumbawa, to the northeast, across the Sumba Strait, is Flores, to the east, across the Savu Sea, is Timor, and to the south, across part of the Indian Ocean, is Australia. Timor is the principal island of the Outer Banda Arc, which has been upthrust by collision with the Australian continent. Timor has older geology and lacks the volcanic nature of the northern Lesser Sunda Islands. The orientation of the main axis of the island also differs from its neighbors. These features have been explained as the result of being on the northern edge of the Indo-Australian Plate as it meets the Eurasian Plate and pushes into South East Asia. The climate includes a long dry season with hot winds blowing over from Australia. Rivers on the island include the Southern and Northern Laclo Rivers in East Timor. The Indo-Australian Plate is a major tectonic plate that includes the continent of Australia and surrounding ocean, and extends northwest to include the Indian subcontinent and adjacent waters. It was formed by the fusion of Indian and Australian plates approximately 43 million years ago. The Eurasian Plate is a tectonic plate which includes most of the continent of Eurasia, with the notable exceptions of the Indian subcontinent, the Arabian subcontinent, and the area east of the Chersky Range in East Siberia. It also includes oceanic crust extending westward to the Mid-Atlantic Ridge and northward to the Gakkel Ridge. The Northern Laclo River is a river in East Timor. It flows northeast into the Wetar Strait, reaching the sea near Manatuto. It has no connection to the Southern Laclo, which flows to the Timor Sea. The largest towns on the island are the provincial capital of Kupang in West Timor, Indonesia and the Portuguese colonial towns of Dili the capital, and Baucau in East Timor. Poor roads make transport to inland areas difficult, in East Timor especially. East Timor is a poor country, with health issues including malaria and dengue fever. Sources of revenue include gas and oil in the Timor Sea, coffee growing and tourism. Timor and its offshore islands such as Atauro, a former place of exile increasingly known for its beaches and coral[ citation needed ], as well as Jaco along with Wetar and the other Barat Daya Islands to the northeast constitute the Timor and Wetar deciduous forests ecoregion. The natural vegetation was tropical dry broadleaf forests with an undergrowth of shrubs and grasses supporting a rich wildlife[ citation needed ]. However much of the original forest has been cleared for farming,[ citation needed ] especially on the coasts of Timor and on the smaller islands like Atauro. Apart from one large block in the centre of Timor only patches remain. [ citation needed ] This ecoregion is part of the Wallacea area with a mixture of plants and animals of Asian and Australasian origin; it lies in the western part of Wallacea, in which Asian species predominate. Many trees are deciduous or partly deciduous, dropping their leaves during the dry season, there are also evergreen and thorn trees in the woodland. Typical trees of the lowland slopes include Sterculia foetida , Calophyllum teysmannii and Aleurites moluccanus . During the Pleistocene epoch, Timor was the abode of extinct giant monitor lizards similar to the Komodo dragon. Like Flores, Sumba and Sulawesi, Timor was also once a habitat of extinct dwarf stegodonts, relatives of elephants. Saltwater crocodiles are found in the wetlands whereas reticulated pythons can be found in forests and grasslands of Timor. However, the population sizes and status are unknown. Portrait of a Timorese warrior in the area of Kupang in 1875, from the report of the expedition of the German ship SMS Gazelle. The earliest historical record about Timor island is the 14th-century Nagarakretagama, Canto 14, that identifies Timur as an island within Majapahit's realm. Timor was incorporated into ancient Javanese, Chinese and Indian trading networks of the 14th century as an exporter of aromatic sandalwood, slaves, honey and wax, and was settled by both the Portuguese, in the end of the 16th century, and the Dutch, based in Kupang, in the mid-17th century. As the nearest island with a European settlement at the time, Timor was the destination of William Bligh and seamen loyal to him following the infamous Mutiny on the Bounty in 1789. It was also where survivors of the wrecked HMS Pandora , sent to arrest the Bounty mutineers, landed in 1791 after that ship sank in the Great Barrier Reef. The island has been politically divided in two parts for centuries. The Dutch and Portuguese fought for control of the island until it was divided by treaty in 1859, but they still did not formally resolve the matter of the boundary until 1912. West Timor, was known as Dutch Timor until 1949 when it became Indonesian Timor, a part of the nation of Indonesia which was formed from the old Netherlands East Indies; while East Timor was known as Portuguese Timor, a Portuguese colony until 1975. It includes the exclave of Oecussi-Ambeno in West Timor. Japanese forces occupied the whole island from 1942 to 1945. They were resisted in a guerrilla campaign led initially by Australian commandos. Following the military coup in Portugal in 1974 the Portuguese began to withdraw from Timor, the subsequent internal unrest and fear of the communist Fretilin party led to an invasion by Indonesia, who opposed the concept of an independent East Timor. 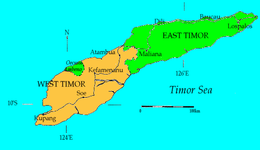 In 1975, East Timor was annexed by Indonesia and became known as Timor Timur or 'Tim-Tim' for short. It was regarded by Indonesia as the country's 27th province, but this was never recognised by the United Nations (UN) or Portugal. The people of East Timor, through Falintil the military wing of Fretilin, resisted 35,000 Indonesian troops in a prolonged guerrilla campaign, but the whole island remained under Indonesian control until a referendum held in 1999 under a UN-sponsored agreement between Indonesia and Portugal in which its people rejected the offer of autonomy within Indonesia. The UN then temporarily governed East Timor until it became independent as Timor-Leste in 2002 under the presidency of Falintil leader Xanana Gusmão. Although political strife continued as the new nation coped with poverty the UN presence was much reduced. A group of people on the Indonesian side of Timor have been reported active since 2001 trying to establish a Great Timor State. However, there is no real evidence whatsoever that the people of West Timor, most of whom are from Atoni ethnicity who are the traditional enemy of the East Timorese, have any interest in joining their tribal enemies. Additionally, East Timor's independence movement never laid claim to West Timor at any time, before the Indonesian invasion or thereafter. Similarly, the government of East Timor fully recognizes Indonesia's existing boundaries as inherited from the Netherlands East Indies. This is similar to the position taken by Papua New Guinea in relation to Western New Guinea, when the former became independent of Australia. Portuguese Timor refers to East Timor during the historic period when it was a Portuguese colony that existed between 1702 and 1975. 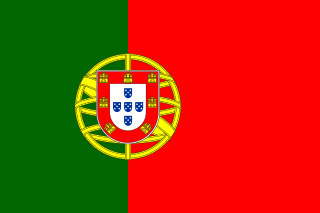 During most of this period, Portugal shared the island of Timor with the Dutch East Indies. Dili, also known as “City of Peace”, is the capital, largest city, chief port, and commercial centre of East Timor (Timor-Leste). Dili is part of a free trade zone, the Timor Leste–Indonesia–Australia Growth Triangle (TIA-GT). East Timor is a country in Southeast Asia, officially known as Democratic Republic of Timor-Leste. The country comprises the eastern half of the island of Timor and the nearby islands of Atauro and Jaco. The first inhabitants are thought to be descendant of Australoid and Melanesian peoples. The Portuguese began to trade with Timor by the early 16th century and colonised it throughout the mid-century. Skirmishing with the Dutch in the region eventually resulted in an 1859 treaty for which Portugal ceded the western half of the island. Imperial Japan occupied East Timor during World War II, but Portugal resumed colonial authority after the Japanese surrender. The Culture of East Timor reflects numerous cultural influences, including Portuguese, Roman Catholic, and Malay, on the indigenous Austronesian cultures in East Timor. Alor is the largest island in the Alor Archipelago and is one of the 92 officially listed outlying islands of Indonesia. It is located at the eastern Lesser Sunda Islands that runs through southeastern Indonesia, which from the west include such islands as Bali, Lombok, Sumbawa, Komodo, and Flores. The Barat Daya Islands are a group of islands in the Maluku province of Indonesia. The Indonesian phrase barat daya means 'south-west'. Wallacea is a biogeographical designation for a group of mainly Indonesian islands separated by deep-water straits from the Asian and Australian continental shelves. Wallacea includes Sulawesi, the largest island in the group, as well as Lombok, Sumbawa, Flores, Sumba, Timor, Halmahera, Buru, Seram, and many smaller islands. The Banda Sea is a sea in the Maluku Islands of Indonesia, connected to the Pacific Ocean but surrounded by hundreds of islands, as well as the Halmahera and Ceram Seas. It is about 1000 km (600 mi) east to west, and about 500 km (300 mi) north to south. Bobonaro Municipality is a municipality in the Democratic Republic of Timor-Leste commonly known as East Timor. It is the second-most western municipality on the east half of the island. It has a population of 92,045 and an area of 1,376 km². The Alor Archipelago is located at the eastern Lesser Sunda Islands. Wetar is a tropical island which belongs to the Indonesian province of Maluku and is the largest island of the Maluku Barat Daya Islands of the Maluku Islands. It lies east of the Lesser Sunda Islands, which include nearby Alor and Timor, but it is politically part of the Maluku Islands. To the south, across the Wetar Strait, lies the island of Timor; at its closest it is 50 km away. To the west, across the Ombai Strait, lies the island of Alor. To the southwest is the very small island of Liran, which is also part of Wetar district (kecamatan) and, further southwest, the small East Timorese island of Atauro. To the north is the Banda Sea and to the east lie Romang and Damar Islands, while to the southeast lie the other principal islands of the Barat Daya Islands. Including Liran, Wetar has an area of 2,651.9 km2, and had a population of 7,916 at the 2010 Census. Atauro Island is a small island situated 25 km north of Dili, East Timor, on the extinct Wetar segment of the volcanic Inner Banda Arc, between the Indonesian islands of Alor and Wetar. Politically it comprises one of the Administrative Posts of the Dili Municipality of East Timor. It is about 25 km long and 9 km wide, about 140.1 km2 in area, and had 9,274 inhabitants at the 2015 Census. The nearest island is the Indonesian island of Liran, 12 km to the northeast. East Timor was a de facto province of Indonesia, whose territory corresponded to the previous Portuguese Timor and to the presently independent country of Timor-Leste. Falintil originally began as the military wing of the political party FRETILIN of East Timor. It was established on 20 August 1975 in response to FRETILIN’s political conflict with the Timorese Democratic Union (UDT). East Timorese Portuguese is a Portuguese dialect spoken in the country of Timor-Leste or East Timor. It is one of the official languages of Timor-Leste alongside Tetum. The northern common cuscus, also known as the grey cuscus, is a species of marsupial in the family Phalangeridae native to northern New Guinea and adjacent smaller islands, but is now also found in the Bismarck Archipelago, south-east and central Moluccas, the Solomons, and Timor, where it's believed to have been introduced in prehistoric times. It was formerly considered conspecific with the allopatric P. intercastellanus and P. mimicus. East Timor or Timor-Leste, officially the Democratic Republic of Timor-Leste, is a country in Maritime Southeast Asia. It comprises the eastern half of the island of Timor, the nearby islands of Atauro and Jaco, and Oecusse, an exclave on the northwestern side of the island surrounded by Indonesian West Timor. 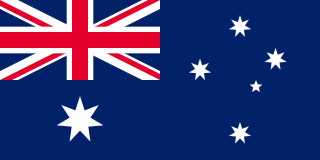 Australia is the country's southern neighbour, separated by the Timor Sea. The country's size is about 15,410 km2. The Lesser Sunda Islands are a group of islands in Maritime Southeast Asia, north of Australia. Together with the Greater Sunda Islands to the west they make up the Sunda Islands. The islands are part of a volcanic arc, the Sunda Arc, formed by subduction along the Sunda Trench in the Java Sea. 1 2 Taylor, Jean Gelman (2003). Indonesia: Peoples and Histories. New Haven and London: Yale University Press. p. 378. ISBN 978-0-300-10518-6. ↑ Gary Holton; Laura C. Robinson (2014). "The linguistic position of the Timor-Alor-Pantar languages". In Klamer, Marian. The Alor-Pantar languages. ↑ Kusago, Takayoshi (2005). "Post-Conflict Pro-Poor Private-Sector Development: The Case of Timor-Leste". Development in Practice. 15 (3/4): 502–513. doi:10.2307/4029980 (inactive 2018-09-10). JSTOR 4029980. ↑ "Timor and Wetar deciduous forests". Terrestrial Ecoregions. World Wildlife Fund.